I spend a lot of time reading and sometimes responding to forum posts in the different travel web sites. I know that a lot of the folks there enjoy the beaches and the volcanoes of Costa Rica. But I also notice that many people have said that there is not a lot to do in Monteverde. My guess is that this is because the activities here are not as “in your face” as they are in other parts of the country, or on an organized tour. I always bristle a little when I read this. As a (very) part time Monteverde resident, I have to disagree. Sometimes you just have to look a little harder. Canopy (zipline) tours. Invented here, and still the best in CR. Maybe the world. 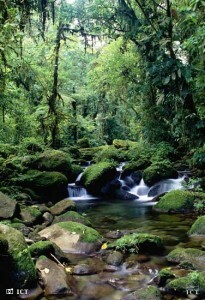 The Monteverde Cloud Forest Reserve. World famous, for good reason. Check out any of the other reserves. The different altitudes create different ecosystems. You will be amazed at the bio diversity up here. Take a horseback tour through the countryside around Canitas. Have Kattya Corrales take you on a private local tour in her little three wheel and partially enclosed motorcycle. Very inexpensive, and she customizes each tour to your particular interest. Take the “Trepiche” tour. A local family farm. They take you from the harvest to the farm’s own production of coffee and sugar. Sweet family, and much more interesting than I expected! Check out the Bat Exhibit (with flight cage), more than you ever wanted to know about bats. But fascinating. After you visit the bats, go upstairs to the little restaurant that makes their own chocolate. Great food here too, Argentine owned. Tour the cheese factory, then enjoy the best milkshake you have ever had. Visit the Orchid Garden just outside Santa Elena. The self taught horticulturist here has created an amazing garden, and even discovered a previously unknown species. We were amazed by the tiny orchids that you need a jeweler’s loupe to see. A perfectly formed orchid in miniature. After your visit to Stella’s, walk across the street to shop for handicrafts made by local women at the CASEM woman’s arts cooperative. You can also buy local coffee from the roaster next door. Hear live music at Moon Shiva. Jazz, folk, Latin, etc. Always entertaining. Check out the Saturday farmer’s market. Definitely some local color. Sometimes there is music, and there is always local food to eat on site. Good Ceviche! Go to the hummingbird gallery. Great photo ops of dozens of hummingbirds. Eat at any of the “International” restaurants. We are getting some interesting food up here!